National cuisine of Peru presents a rich mix of European traditions (since the time of Spanish conquerors) and Native American eating habits. Spicy, nourishing, sometimes piquant or sweetish – you can pick up a lot of adjectives for the Peruvian cuisine, but the best way is to taste it all! This is a traditional dish in the San Juan Festival. It has the shape of a large tamale – one of the Latin American dishes that looks like an envelope with filling, wrapped into a corn or palm leaf. Juane is prepared with rice, chicken and eggs and then wrapped into a sheet called Bihan. This meal is usually prepared in the traditional way – on the coals or wood. 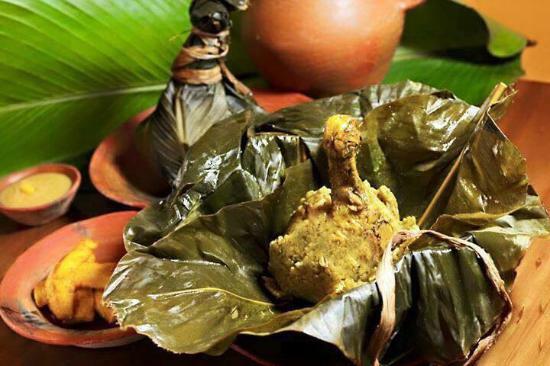 This dish is similar to the previous one, but it is prepared with whipped eggs and chicken and wrapped into a banana leaf. Tacacho is a roasted banana dish of the Amazonian cuisine. 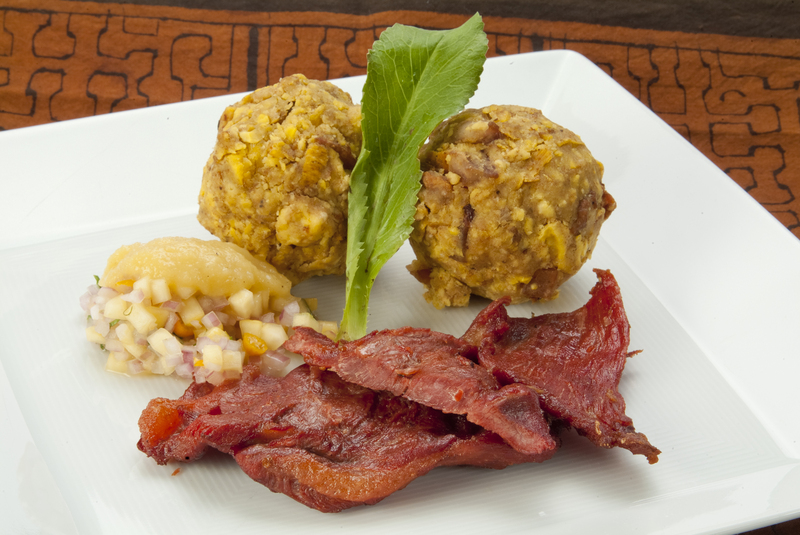 Tacacho con cecina is served with dried and smoked pork. There is also an option to taste Tacacho chorizo – roasted banana with local sausage, which is made from ground beef with a lot of spices. 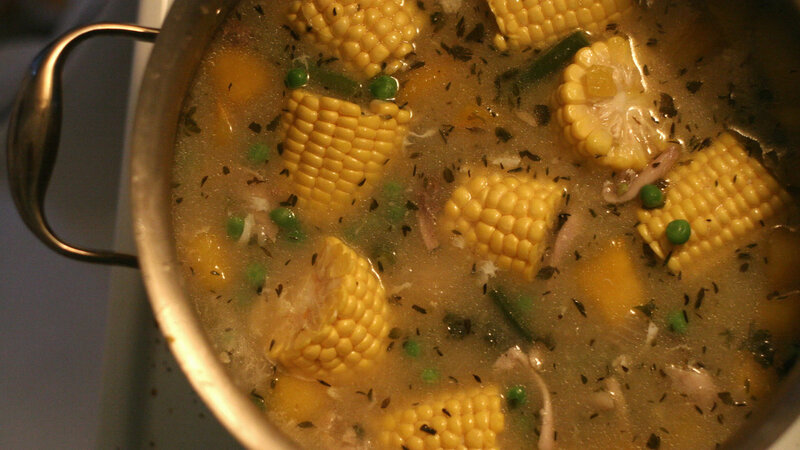 National thick soup prepared with ground peanuts, chicken, cassava, corn, coriander leaf, garlic, salt and cumin. The typical food of the jungle, which includes any kind of local fish wrapped into banana leaves or Bihan leaves. This dish can be steamed, baked or boiled – and, of course, with the addition of spices. A fish soup with whipped eggs and cilantro. It is called “a dish raising from the dead” among the local people because of the restorative qualities that help to recover from debilitating holidays. The common name for the dishes made with meat of wild animals: deer, wild pigs, tapirs, armadillos, agoutis and other inhabitants of the tropics. There are some different ways of cooking them – stewing, frying, boiling in soups etc. Soups made from the meat of wild animals (see above) with the addition of grated yucca (palm of the family Agavaceae, Rumo Api) or corn (Sarah Api). 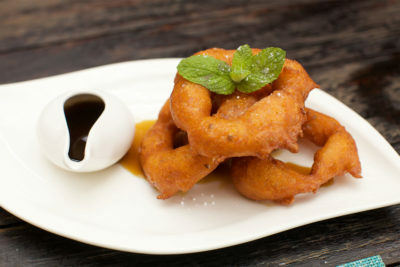 Spicy donuts made from pumpkin and sweet potatoes that are fried in oil and served with citrus syrup (miel de chancaca). It is quite popular Peruvian street food, a typical portion consists of three donuts. 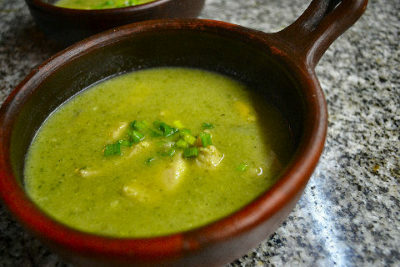 Pachamanka is a traditional Inca cuisine dish, which is prepared in the countries of the Andes on special occasions. In the language of the locals the word “pachamanka” means “hole in the ground”. It is made of several types of meat, potatoes, green bananas, corn, herbs and spices in the unusual way – in a pit lined with hot stones. This allows the meat and vegetables to be soaked with scent of leaves and wood. Roast beef with vegetables, served with rice or potatoes (sometimes all together). Stewed in soy sauce with white wine and lime juice. Peru is a birthplace of potato: here you can find hundreds of varieties for every taste and size! Not surprisingly that potato dishes is the most common meal on the table of Peruvians. 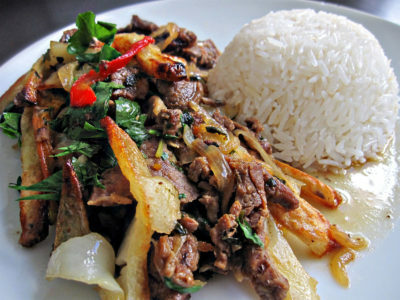 For example, Huankaina Papas, which is known worldwide as a “potato in Peru style”. It is served under the melted cheese sauce with cream and spices. Another popular dish of the national vegetable. 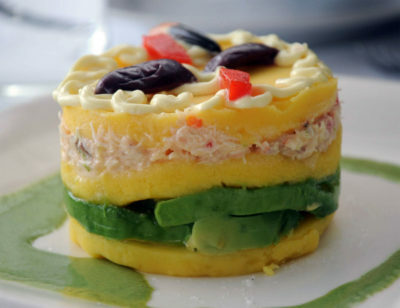 In fact, causa is a potato cake with layers of different fillings. The classic version – with canned tuna, avocado, hard boiled egg or meat stuffing. The hot and humid climate of Peru presents a rare opportunity to taste different exotic fruits. One of the most interesting of them is cherimoya, which is used by Latin Americans as an ice-cream when it is frozen. Indeed, this fruit with the delicate flavor and a round shape looks very similar to a ball of ice cream.